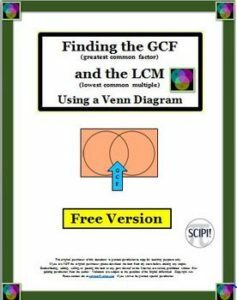 This 8 page free resource begins with the definitions for the math words factor, greatest common factor and least common multiple, and continues by explaining and illustrating what a factor tree is and how to construct and use a Venn Diagram as a graphic organizer to find the least common multiple. Also incorporated into this free resource is how to use the two circle graphic organizer to factor out the Greatest Common Factor for polynomials or algebraic terms. A detailed example is provided to show how this same process can be used in algebra. One of the practice pages is entitled “What’s Missing?” and requires the student to read a Venn Diagram to find the two missing numbers, their factors, the LCM and the GCF. A half page of three blank two circle Venn Diagrams is included. What if there are three numbers? A three circle Venn Diagram would be used. This is fully shown in detail followed by a student practice page. A half page of blank, three circle Venn Diagrams is added to the resource so that the students can practice. This resource is an effective and valuable tool when teaching fractions. It is also applicable and helpful in algebra when students are asked to find the LCM or GCF of a set of algebraic terms such as: 25xy, 40xyz. (LCM = 200xyz; GCF = 5xy) or when they must factor out the GCF from a polynomial such as 6x2y3 + 9xy2. An answer key is included.